Fish ponds & blanket weed problems. I am often asked how to rid fish ponds of blanket weed. There are 100s of treatments out there and it can be very time consuming and expensive to try them all. This article will hopefully save you the time and money as my recommendations are drawn from over 15 years experience with fish ponds and is based on what I have learnt and observed. Garden fish ponds and koi ponds all suffer with some sort of blanket weed problem at some point. Other common names include hair algae and filamentous algae. There are a number of varieties and they are all experts at in one thing. Covering your ponds surface and sides. Many pond owners do not find this desirable and go to great lengths to eradicate it. Unlike water features and swimming pools you can not add bromine or chlorine to clean and sanitise the water as this will cause the ponds ecosystem to crash. Do you have a hair like algae growing in your pond? Is blanket weed ruining the enjoyment of your fish pond? 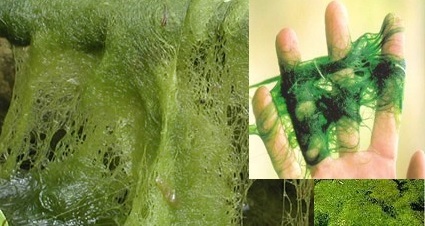 Blanket weed is a long green hair/string algae that grows on the sides of a pond; it also attaches itself to plants and can be free floating. This can look very unsightly and can make maintaining a pond a very time consuming job. Over the years Water Scenes have trialled an assortment of treatments and gadgets all promising to solve your blanket weed problems. Some have had more of a positive effect than others. Up to 2007 our company, Water Scenes had always championed Pond Balance by Interpet as a way of keeping blanket weed at bay. It was not guaranteed to totally rid your pond but was fairly successful. A 1.8Kg pack contains enough Pond Balance to treat 9000 Gallons of pond water or a 3 dose course for a 3000 Gallon pond. The treatment is mineral based and can be used in conjunction with an ultra violet light. Pond balance helps to reduce blanket weed and should stop it sticking to plants and the sides of the pond. This makes maintenance much easier as free flowing blanket weed is the easiest to remove. 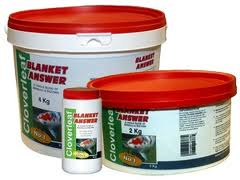 More recently we discovered Blanket Answer by Cloverleaf. An 800g pack contains enough Blanket Answer to treat around 2000 Gallons of pond water. 2kg Blanket Answer treats 5000 Gallons. 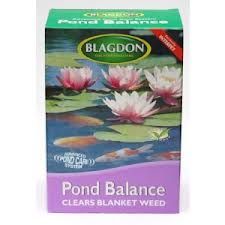 This treatment is quite like Pond balance in that it is mineral based but has the added bonus that it seems to rid most ponds of blanket weed “even koi ponds.” We don’t pretend that it will rid all ponds of blanket weed but we do think it is a good place to start. I always recommend that you remove as much blanket weed as you can before using any blanket weed treatment. Doing this will increase the effectiveness of the treatment. I find the most effective way to remove blanket weed is to use a fine particle pond net. Alternatively check out my article on floating fountains for lakes.